Deep in the Heart of history. The record of the human world, full of changes and vicissitudes. Will never forget their gratitude to the Astoria. The "changes and vicissitudes" led the Japanese to "forget their gratitude to the Astoria" on 9 August 1942. Commander Expeditionary Force (CTF 61) set the radio call authenticator for 9 August 1942, to be used on that same day by all ships in his command to verify their messages, as "Wages of Victory." It was a prophetic choice, for the "Wages of Victory" at Tulagi and Guadalcanal was Savo Island. No American can be happy about the Battle of Savo Island. A good many professional United States naval officers feel a stinging sense of shame every time the words "Savo Island" are uttered. submitted on 11 August 1942 to COMSOPAC with his letter to CTG 62.6 (Crutchley). Diagram and letter forwarded by COMSOPAC to CINCPAC and COMINCH. Battle Area Dispositions, Savo Island. Commanding Officers still alive, as well as gathering a large amount of documentary evidence. It is not the intention to rehash in detail here this sad story of the U.S. Navy in its first night heavy surface ship fight with the Japanese Navy. if there are any readers who are not familiar with this night battle, such readers should consult Morison before going further in this Chapter. Suffice it to record here that it occurred at the Savo Island terminus of a skillfully concealed Japanese dash south from Rabaul. It was carried through by a hastily gathered eight ship cruiser-destroyer force, which in the early hours of 9 August effected complete surprise and one-sided damage in turn to two different five-ship Allied cruiser-destroyer units patrolling to protect our transports at Tulagi and Guadalcanal. The Japanese Navy achieved a stunning victory. It was aggressive in the planning concept of this operation and it was equally aggressive in carrying it out. Their night-time operational ability was far superior to that of the U.S. Navy ships companies which they encountered. They cleared from the roster three United States heavy cruisers and one Australian heavy cruiser with minor damage to their own ships. They placed the waters lying between the islands of Guadalcanal and Tulagi on the books as "Iron Bottom Sound" and manned it with an initial complement of United States Navy and Australian Navy ships. Whatever responsibility for the defeat is mine, I accept. We took one hell of a beating. The Japs sank four cruisers, but missed their greatest opportunity during the war to sink a large number of our transports with surface ship gunfire. This was at a time when it would have really hurt, because we didn't have 50 big transports in our whole Navy. We got up off the deck and gave the Japs one hell of a beating, and the so and so critics can't laugh that off. In this connection, Admiral Nimitz was asked the question by this writer: "Did you contemplate having Admiral Turner relieved after the defeat at Savo Island?" The reason that Admiral Turner applauded the Hepburn Investigation is not difficult to find. In it there was no direct or implied criticism of Rear Admiral Turner's action or decisions. One can take his pick--either (1) the ever changing appraisals of the semi-official naval historian; (2) the inordinately biased hocus-pocus of the popular fiction writer; (3) the analysis of the Naval War College as to why Savo Island happened and what was the degree of responsibility of the various seniors present, including Commanding Officers of the various ships; or (4) make up his own mind from the existing official record. I deem it appropriate and necessary to record my approval of the decisions of and conduct of Rear Admiral R.K. Turner, U.S. Navy, and Rear Admiral V.A. Crutchley, Royal Navy. In my judgment, those two officers were in no way inefficient, much less at fault, in executing their parts of the operations. Both found themselves in awkward positions, and both did their best with the means at their disposal. Admiral King was thoughtful enough to provide a copy of his endorsement to Rear Admiral Turner and Rear Admiral Crutchley. 5. . . . Adequate administrative action has been taken with respect to those individuals whose performance of duty was not up to expectations. and the reviewing officer on the staff of the Commander in Chief, U.S. Fleet, for the Admiral Hepburn investigative Report gave more detail on the administrative action. He later was Judge Advocate General of the Navy and then a Vice Admiral, U.S. Navy. His review was passed on and concurred in by the Deputy Chief of Staff, Rear Admiral W.R. Purnell, later Vice Admiral, U.S. Navy, and the Chief of Staff, Vice Admiral R.S. Edwards, later Admiral, U.S. Navy. (a) Vice Admiral Ghormley, who was head man in the area, and therefore answerable for the operation, was relieved not long afterward. Regardless of the fact that no reason for his change of duty was announced, there was a stigma attached to it, with everything indicating that he was relieved because of this defeat. . . .
(b) Admiral Hepburn mentions the failure of Rear Admiral McCain to search out the area in which the Japs must have been, after Rear Admiral Turner, in effect, asked him to do so, but apparently does not feel that he should be called to account for it. . . .
(c) Admiral Hepburn gives Admiral Turner pretty much a clean bill of health. * * * * * (d) Vice Admiral Fletcher and Rear Admiral Noyes have been relieved of their commands. Again no reason has been assigned, but the inference is that the latter, at least, has been tried and found wanting. In other words, something has already been done, administratively. The two-volume Naval War College analysis, in its 23 pages of "Battle Lessons," mentions no personalities, but some of the biting "Lessons" apply directly to specific actions of specific command personalities. There are 26 Lessons. One of these was pertinent to Rear Admiral Turner personally. Nearly all of them are pertinent to every naval officer exercising command in the nuclear age, as well as in World War II, and several will be mentioned later in the chapter. Lack of respect for Japanese aggressiveness. Lack of a specific night action battle plan in the Screening Group in event of an undetected surprise raid. Lack of combat reaction at the command level in the cruisers and destroyers of the Screening Group, or lack of a specific night action plan for these units. Delay of Screening Group Commander in rejoining his command. Withdrawal of Air Support Force. Lack of night battle training. Lack of appreciation of the limitations of radar, or radar failures. Failure to have more picket destroyers. Division of heavy ships (CA and CLAA) of Screening Force into three groups. Failure to maintain the prescribed condition of ship readiness in the heavy cruisers. The United States Navy's obsession with a strong feeling of technical and mental superiority over the enemy. Turner had it [the despatch] too, and he knew he was in trouble. Later, they could not say for sure when they first knew it, but for certain the fleet knew by midafternoon that the Japanese were coming. The Army history and the Marine monograph cite as their authority the following entry in the 8 August 1942 War Diary of Rear Admiral Turner as Commander Amphibious Force South Pacific Force. About 1800 information was received that two enemy destroyers, three cruisers, and two gun boats or seaplane tenders were sighted at 1025Z at 5°49'S, 156°07'E course 12°, speed 15 knots. Canberra completed its transmission at 081837, and Pearl Harbor completed its transmission on the Fleet (or FOX) broadcast schedules at 081843. Plane sightings of Vice Admiral Mikawa's Cruiser Force. Vice Admiral Gunichi Mikawa, IJN. McCawley had only two transmitters and five radio receivers, and could not spare one of the receivers to guard the Australian BELLS circuit.18 The message, not in the air until 1843, was decoded and available on the Flag Bridge of the McCawley about 1900, and not about 1800 as the War Diary entry would indicate.19 Rear Admiral Crutchley in the Australia received the message via the Australian BELLS broadcast circuit at 1837, since the Australian ship guarded this circuit in lieu of the American FOX schedule. He did not pass it to Rear Admiral Turner in the McCawley. This factual difference of one hour between the times many have assumed the message was available, and the time it was actually available to Rear Admiral Turner is important. The sighting of the Japanese task force was some eight and a half hours old. 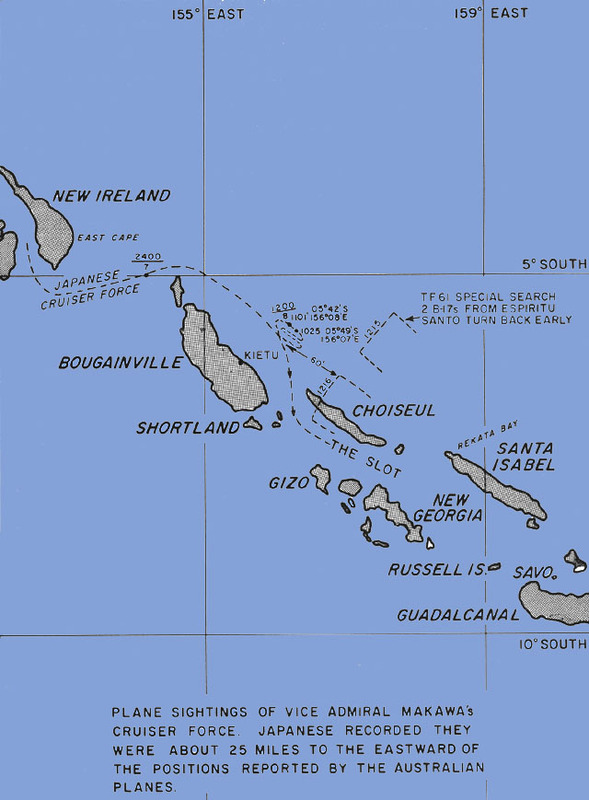 The Japanese ships were 40 miles east of the town of Kieta situated on the east central shore of the island of Bougainville as shown in the map on page 363. They were not "In the Slot" but well east of it. Their reported course was not the course "Down the Slot," nor a course that would put them "In the Slot." Their reported speed was far from the 22-26 knots necessary to get them the 340 miles to Guadalcanal island the night of 8-9 August. He not only failed to identify what he saw, but he failed to trail his contact, and he failed to report promptly. Four of the five Japanese heavy cruisers were sister ships, alike as peas in a pod from a distance. A later sighting of Vice Admiral Mikawa's Cruiser Force was made at 1101 by another of General MacArthur's Hudsons on Flight A16/185. This 1101 sighting suffered an even longer delay before reaching the officers who needed the information. The aviator did not get this sighting on the air for nine hours and 46 minutes after the occurrence. This 080947 report, when considered alongside the previous one, further confused the picture as seen by Rear Admiral Turner. 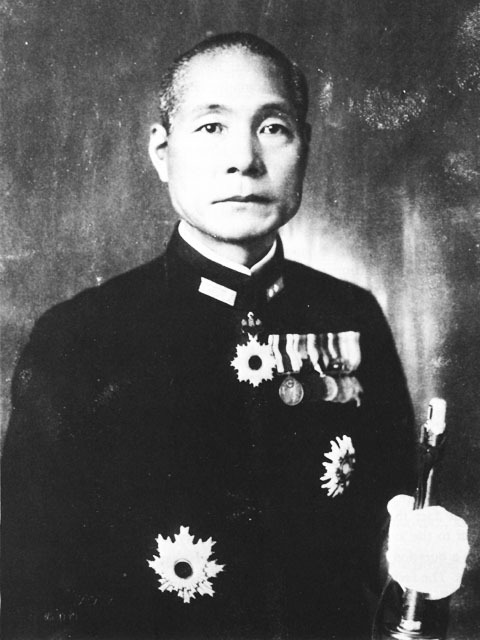 Vice Admiral Gunichi Makawa, IJN. How the Japanese ships all in sight of each other sighted the plane, and the plane did not correctly count the number of ships below it, lacks a ready explanation, except for the "fog of war. It is an amazing fact, but one showing the vagaries of radio communications, that Vice Admiral Ghormley apparently was not cognizant of the 1025 sighting of the Japanese Cruiser Force until after Rear Admiral Turner arrived back in Noumea and told him of it. with the Japanese cruisers, when the TF 63 Army Air Force planes turned back at 1215 some 60 miles south of the Japanese cruisers and far, far short of the 750-mile search which had been expected and of which the B-17s were capable.
. . . .this important negative information did not become known to Rear Admiral Turner until the next day. . . . The problem of the undetected approach of the Japanese cruiser squadron to Guadalcanal was one which could have been solved but was not. While it is the inadequate performance of the individual Australian pilots which is more often publicized when pre-Savo Island air reconnaissance is mentioned, there is also to be considered the record of inadequate search plans by CTF 63. These plans were a real help to the Japanese cruiser force. CTF 61 (Vice Admiral Fletcher) had alerted CTF 63 (Rear Admiral McCain) to the problem of the undetected approach as early as 29 July in a message to Rear Admiral McCain in connection with Dog Day and Dog Day minus one. In view of the decreased number and the later initiation of air reconnaissance by Rear Admiral McCain's forces, Rear Admiral Turner sought to better the air reconnaissance by having six VO planes placed directly under his command. He requested them from COMSOPAC. Rear Admiral Callaghan noted this in his post-26 July conference memo to Vice Admiral Ghormley. subordinates did or did not do certain things, filed with Admiral Hepburn's investigation of this 7-10 August 1942 period. CTF 63's story just is not currently available. The War Diaries of COMAIRSOPAC and the USS McFarland, seaplane tender at Maramsike Estuary, Malaita, record only the incomplete nature of the planned searches. Admiral Turner desired that the air reconnaissance matter be thoroughly researched in available records and then presented to him again. He died before this was done. of any 'approaching' Jap force, I would have done something--maybe the wrong thing, but I would have done something. What they wrote is just a g.d. distortion, and that sort of thing is why I want you to be g.d. certain that you don't distort in what you write. What I failed to do was to assume that the g.d. pilots couldn't count and couldn't identify and wouldn't do their job and stick around and trail the Japs and send through a later report. And I failed to assume that McCain wouldn't keep me informed of what his pilots were or weren't doing. And I failed to guess that despite the reported composition of the force, and the reported course, and the reported speed, the Japs were headed for me via a detour, just like we arrived at Guadalcanal via a detour. I wouldn't mind if they said I was too g.d. dumb to have crystal-balled these things, but to write that I was told of an 'approaching force' and then didn't do anything, that's an unprintable, unprintable, unprintable lie. Nobody reported an 'approaching force' to me. They reported a force which could and did approach, but they reported another kind of a force headed another kind of way. This was a request not lightly to be disregarded or denied. It was received before the message reporting 40 heavy Japanese bombers heading toward the Tulagi-Guadalcanal area, which required all the transports, including the McCawley, to get underway. The COMPHIBFORSOPAC Staff members interviewed could not remember why their Admiral had put off Rear Admiral Crutchley until evening. In 1961-1962 they rationalized that it was probable that CTF 62 (Turner) felt, at that mid-morning hour, and with no favorable reports in from Tulagi where the Marines had been held up, that he did not know enough more than CTF 62.6 (Crutchley) did about the "present situation and future intentions"
Soon thereafter the transports all were underway because of a Japanese air attack. The transports remained underway until just before 5 p.m.
1025 on 8 August, 340 miles northwest of Guadalcanal, on course 120°, speed 15 knots. It was the inclusion of the words '2 seaplane tenders' in that aviator's despatch which threw me for a loss. A seaplane tender except for the seaplanes on its elevator platform looks like a merchant ship. It is a merchant ship with special seaplane handling gear and stowage space. It doesn't look like a cruiser, or a destroyer or a gunboat. We didn't have very many in our Navy. By looking at Jane's fighting Ships we learned the Japs had about ten--more or less--basically the same design as ours. Top speed for our seaplane tenders was about 16 knots. The new Jap seaplane tenders were supposed to be a bit faster. [Jane's 1942 gives 3 of them credit for 20 knots, others top speed of 17 knots.] I didn't think 3 Jap cruisers and 3 destroyers would come to Guadalcanal and attack our 7 cruisers and 25 destroyers and I didn't think any seaplane tenders would be sticking their nose up close to our carriers, when they couldn't run any faster than 17 to 20 knots. I did consider the capabilities of the reported enemy, but I didn't take these capabilities and multiply them by three or four and then dirty my trousers. If every time that a report had come in to Ghormley or Halsey or me during the next six months that some part of the Jap Navy was at sea 350 miles from Guadalcanal and their capabilities had been multiplied three or four times, we would have all died of fright and never would have licked them. Was It a Mistake to Divide the Screening Group? In regard to Morison's opinion that Rear Admiral Turner made the mistake of dividing the Screening Group, the following information and opinions have a bearing on this matter. The primary reason for the division of screening forces into two main units and one lesser unit on the nights of 7-8 and 8-9 August was the geographical lay of the land and the required positioning of the two transport groups to accomplish the basic TF 62 mission. 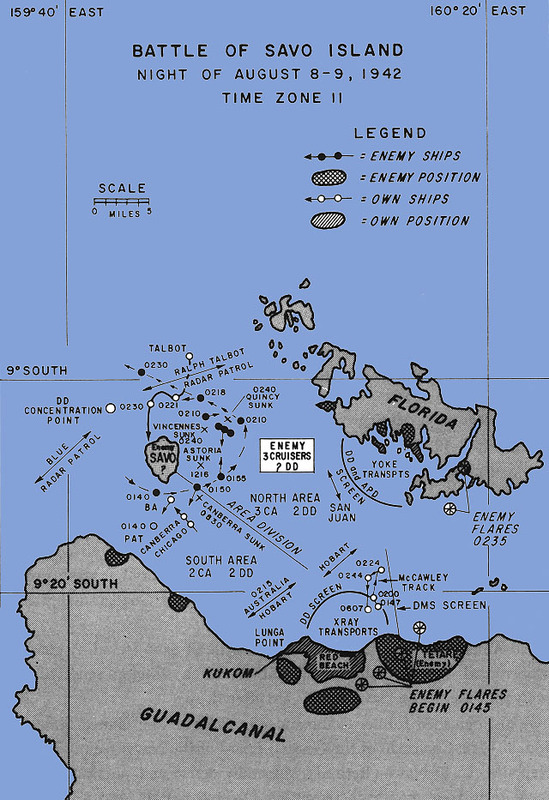 A two-ship light cruiser unit, one Australian and one United States, was stationed in the sector east of the meridian of Lunga (160° 04' E) to cover an unlikely Japanese cruiser approach but possible enemy destroyer or PT boat approach through the restrictive waters in and surrounding Lengo Channel or Sealark Channel. To the westward past Savo Island, there were two entrances to block. The northern was 12 miles wide, the southern seven and a half miles wide. These distances were such that the six heavy cruisers in one station keeping formation could not accomplish this blocking objective by withdrawing far enough to the eastward of Savo Island to obtain safe night maneuvering room without coming up against the northern Transport Area. Here it would be highly undesirable to fight a night battle, since it would put the transports within range of the enemy guns and torpedoes. If the heavy cruisers were projected to the westward and immediately beyond Savo Island, having the six heavy cruisers in one column formation at a practical night cruising speed in limited waters, 18 knots, would open up one entrance for the enemy to slip through when the formation was reaching the extremity of the other entrance. Ships disposition prior to Savo Island Battle. I would point out that neither Australia nor Canberra were fitted with T.B.S. [Voice radio] and they had done some night training with Chicago and Desron 4, but none with the other cruisers, thus it was my firm intention to avoid handling a mixed force at night. Speaking generally, I consider heavy ships in groups of more than 4 to be unwieldy at night. 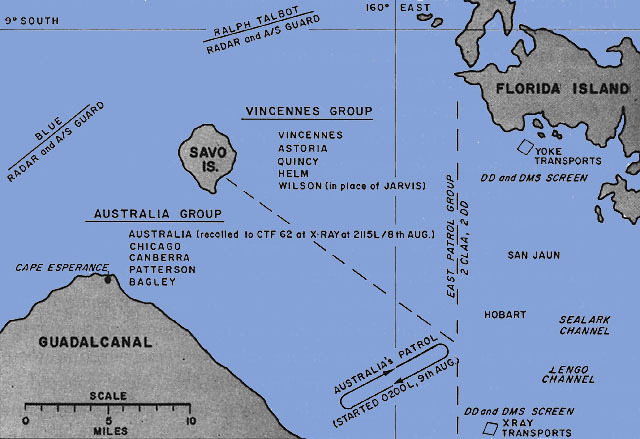 Rear Admiral Turner may be charged by historical theorists with a mistake in approving this procedure, whereby the Vincennes group operated under one set of detailed instructions and the Australia group under another, instead of demanding Combined night training on the way to the battlefield under the Australian set of instructions. But few salt water sailormen of the pre-radar, pre-voice radio eras will so charge either him or Rear Admiral Crutchley who sponsored the procedure. The basic task was protection of the transports and cargo ships by the Screening Group irrespective of the approach route of a Japanese surface force. A plan which protected only against the particular approach chosen by the Japanese would not have passed muster. Crudiv 6 was to attack the transports at GUADALCANAL, while Crudiv 18 was to attack the TULAGI transports. Until someone comes forward with a workable alternate plan whereby the three approaches to the two groups of unloading transports could all be covered by an undivided Screening Group, labeling the division of the Screening Group a mistake is an opinion of one uninformed (a) of the seagoing standards and procedures of the Australian and United States Navy in August 1942, or (b) that all the cruisers in TF 62 had not been trained together, or (c) that all the ships of the United States and Australian Navies in TF 62 were not fitted with both radar and voice radio, or more probably, (d) of the lay of the land and depths of water in the Savo area. There was another important reason which would have made me reject the idea, had it occurred to me, of transferring Scott to the Vincennes. Scott had been a Flag officer a very short time, and on this expedition was exercising his first semi-independent Flag command. He and Riefkohl of the Vincennes were Naval Academy classmates, and, until his promotion, Scott had been the junior. Riefkohl was considered a good officer and apparently was performing his tasks satisfactorily. To have superseded Riefkohl on his own ship by a classmate recently promoted over him would have been a heavy blow to general morale, and would have gone far toward destroying all prospects of Riefkohl's future usefulness and chances of promotion. Furthermore, a Flag officer's effectiveness is temporarily impaired when suddenly transferred to a strange flagship. But, one may add, at the price of a galling defeat. The error in judgment in regard to the Screening Group would not appear to have been in dividing it into three fighting groups; more realistically the judgment error was in the split of the destroyer types between picket duty and anti-submarine duty. This division of strength resulted in an inadequate assignment of only two destroyer-types to picket duty to the west of Savo Island. Disposition of Patrol and Screening Groups prior to the Battle of Savo Island. Two destroyers, a minimum, were assigned to anti-submarine duty around each of the three cruiser forces in the North, South, and East. Two other destroyers were assigned to picket duty. Five destroyers, four destroyer-type transports and five destroyer-type minesweepers were assigned to anti-submarine duty around the two transport groups (XRAY and YOKE), in an outer and an inner anti-submarine patrol. This was somewhat more than the limited sea room called for. Shifting of the two destroyers in the outer anti-submarine patrol around the XRAY group of transports to picket duty could have paid big dividends on the night of 8 August 1942, and still left a strong anti-submarine patrol of seven anti-submarine craft for XRAY and five for YOKE. Knowledge in regard to the capabilities and limitations of radar in early August 1942 was limited. Multiple Approach routes; inadequate radar pickets, prior to the Battle of Savo Island. batteries of the cruisers, and an early alert to the presence of the enemy ships. At 1807 local time 8 August, 1942, Vice Admiral Fletcher (CTF 61) sent this message to COMSOPAC (Ghormley). Fighter plane strength reduced from 99 to 78. In view of large number of enemy torpedo planes and bombers in this area, I recommend the immediate withdrawal of my carriers. Request tankers be sent forward immediately as fuel running low. This was one reason he flew his flag in the Saratoga, whose Commanding Officer, Captain DeWitt C. Ramsay (later Vice Chief of Naval Operations and then Commander in Chief, Pacific) was known to be up on the step and rising fast. Despite the loss of four carriers at the Battle of Midway, the Japanese Navy in August 1942, still had as many battle line carriers (Junyo, Shokaku, Zuiho, Zuikaku) as the United States Navy. From the middle of the afternoon of Friday, 7 August, when Japanese dive bombers hit destroyer Mugford, Vice Admiral Fletcher had been keenly alert to tile possibility of Japanese carriers being in the vicinity. These dive bombers were from the 25th Air Flotilla land based on Rabaul, but Vice Admiral Fletcher was not sure of this and they were a type of aircraft which could have been flown off carriers. Soon after this dive bomber attack, he suggested to Rear Admiral Noyes, Commander Air Support Group, that the Saturday morning air search be toward Rabaul. 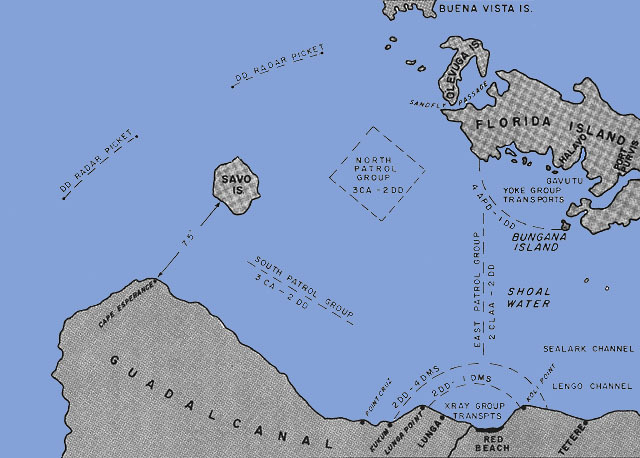 This northwesterly direction tied in with a practical position of the carrier which had been reported (erroneously) by General MacArthur's reconnaissance planes on the day before the landing. These Southwest Pacific planes, on 6 August, in error had reported an enemy carrier (15,000 tons) and three destroyers 32 miles south southwest of Kavieng in latitude 03022J South, longitude 150030J East, roughly. One hundred twenty miles west of Rabaul and 660 miles northwest of Guadalcanal, and to compound the error the carrier sighting had been "confirmed by photographs," with full data.80 Actually only Japanese destroyers were sighted. The possibility of Japanese carriers being in the Solomons area continued to affect the disposition of aircraft all during Saturday, the 8th of August. Commander Air Support Group continued to refuse requests to divert the Saratoga's fighters to provide additional combat air patrol over the amphibious forces even when it was known as early as 0957 that "40 large twin-engined planes" were enroute south to attack and that the first United States ships they would meet would be the transports. When this large scale torpedo plane attack on the 8th of August was detected heading southeast, the Fighter Director for the carriers recommended to Fletcher, the Task Force Commander, the following disposition of aircraft. All Saratoga available fighters Tulagi at 1100 plus one half Wasp fighters. Over carriers all Enterprise plus one half Wasp. However, the Fighter Director ran into a stone wall, either at the Air Support Group Commander (Noyes) level or at the Task Force (Fletcher) level. The following despatches give the questions and the answers. Fighter Director requests Saratoga launch 8 VF Combat air Patrol for carriers at 0830. And at 1030. Your . . . not approved. Saratoga must be ready to launch for or in case of attack. Please carry out my _______. * * * * * Saratoga does not appear to be complying with my orders for today's operations which require her until noon to maintain fighters and attack group ready for launching at all times in case of bombing attack or locating of enemy CV. Please refer conflicting requests to me. * * * * * Red Base again requests eight VF for combat patrol from me. Advise. After the large scale Japanese morning torpedo plane attack against the amphibious forces on 8 August had been completed, having been met with devastating surface ship anti-aircraft fire--but a minimum of fighter opposition--and the results reported to the Expeditionary Force Commander (Fletcher), he had difficulty being convinced that the Japanese had carried out such a large scale torpedo plane attack. Request any information about attack this morning. Were planes actually carrying torpedoes? When assured of the actuality and multiplicity of the torpedoes, including one that had missed the McCawley's stern by "about 40 feet," the Expeditionary Force Commander made his decision to recommend withdrawal of the carriers because of the possibility of new torpedo plane attacks. If the Expeditionary Force Commander (Fletcher) had not been worried greatly about there being a Japanese carrier over the horizon, it seems quite logical that he would have stepped in earlier and suggested to his senior subordinate (Noyes), the Air Support Commander, that 40 Japanese large twin engine planes were a sufficiently worthy target to justify diversion of defensive fighters to offensive use. This Japanese torpedo plane attack was the one which torpedoed the Jarvis and directly led to her being sunk the next day, 9 August, by the Japanese 25th Air Flotilla, with the loss of all hands. (2) The Fuel Problem--Strawman or Real. Fuel situation this Force becoming critical. It is estimated the destroyers have fuel for about three days at 15 knots, and the heavy ships have little more. Every naval commander at sea in Word War II suffered from that strange logistical disease of AFFAG, and the malady affected some officers much more than others. For AFFAG related to the amount of Ammunition, Fuel Oil, Food and Aviation Gas, in each of the ships of his command at any given hour of the day. And COMSOPAC knew the Tanker Esso Little Rock had missed her rendezvous with Task Force 61 at Efate. # Low Ship in Group on 8 August, the day the withdrawal recommendation was made. Due to enemy air attacks and reduction of fighters in our forces due to losses, together with critical fuel situation, has caused CTF 61 [Fletcher] to recommend to COMSOPAC [Ghormley] that carriers be withdrawn. The English in this entry was as questionable as the decision it noted. The reduction in number of fighters had been caused by operational losses, as well as by enemy action. Indicative of the communication time delays directly affecting operations is the delay surrounding the CTF 61 despatch requesting retirement. It went off a few minutes after 6:00 p.m. (081807). It was five and a half hours before a reply was originated by COMSOPAC and more than nine hours elapsed before COMSOPAC's 081144 reply was received in Turner's flagship, the McCawley, and it surely took another half hour to decode, write up, and deliver to Turner's Flag Bridge (090330). In the meantime between 7 p.m. and 4 a.m., many decisions had to be on a tentative basis, depending upon what turned out to be the final COMSOPAC decision. United States over-all carrier strength was at low ebb--four. The Japanese Navy could put more carriers in the area than TF 61 had in the area (4 vs 3). Japanese land based air (high level bombers, dive bombers and torpedo planes) was present and offensively active. CTF 61's instructions from CINCPAC were positive and limiting in regard to risking the carriers in the command. This in turn had been followed by another despatch from CINCPAC on the eighth. On top of these fundamentals was one factor that Admiral Fletcher could not remember having seen discussed in public print since his 8 August 1942 decision, but which was much in his mind at that time. This factor was that the Japanese Zero plane and its pilot were given a very high rating in August 1942. In connection with the performance of the Zero fighter, any success we have had against the Zero is not due to performance of the airplane we fly but is the result of the comparatively poor marksmanship on the part of the Japanese, stupid mistakes made by a few of their pilots, and superior marksmanship and teamwork on the part of some of our pilots. On 7 August, CTF 16 [Kinkaid] sent a despatch saying his destroyers, except Gwin, had fuel remaining for two days at a speed of 15 knots. * * * * * At noon 8 August CTF 18 [Noyes] reported his destroyers had fuel remaining for only 31 hours at 25 knots. * * * * * At noon 8 August destroyers of Task Force 11 [Fletcher] had fuel remaining for only 35 hours at 25 knots. * * * * * It was not practicable to fuel destroyers from cruisers as the latter only had fuel available for 50 hours at 25 knots. It is apparent that the virus of AFFAG was virulent in the Air Support Force on 7 and 8 August and that the CTF 16 (Kinkaid) despatch, if quoted correctly by CTF 61, was downright misleading, since TF 16 did not actually fuel until 1700 on 10 August and the destroyers of TF 16 did steam at speeds of 15 knots or higher in the meanwhile. Scanning the figures in the fuel table given in detail before, from the safe distance of 25 years, might lead one to observe that on the 8th of August 1942 when Rear Admiral Kinkaid was making the entry in his War Diary, only the Grayson (DD-435) (Lieutenant Commander Frederick J. Bell) justified the critical stage of worry about fuel which undoubtedly existed in TG 61.1. Even though not critical, the fuel situation in the Expeditionary Force was a problem as indicated in the report of the transport President Jackson which was landing troops at Tulagi the morning of 7 August. At 0759 rigged ship for fueling destroyers of TRANSDIV 12 (APDs). Forrest Sherman, Commanding Officer of the wasp, tried to persuade Admiral Noyes to recommend to you to turn north after the first word was received of the Japanese surface ships being in the Guadalcanal Area. Did anyone try to persuade you to do this? Did this thought occur to you? I didn't know anything about Savo Island happening until about five to six the next morning, and I couldn't get through to Kelly Turner by radio and get details in regard to the Japs. One or two of my staff recommended that we go back. I said if I was a Jap, I would have planned on all our carriers coming back and would hit them with all my land based air. For some reason the Saratoga did not or could not copy CTF 62's blind despatches sent that night, and it wasn't until other ships sent us the news by blinker or infrared that we started to get the word about the Battle of Savo. It's at least an 'iffy matter', as FDR used to characterize tough posers, whether a hard driving Marine offensive against the Guadalcanal Japanese starting on the 9th wouldn't have destroyed or completely dispersed the nucleus of Japanese forces on Guadalcanal Island. This would have permitted an adequate shore welcoming reception party for the first Japanese re-enforcements [5th Sasebo Special Naval Landing Force] whose advance elements of about 200 men aboard a single Jap destroyer [the Oite] arrived a week later--16 August--and made an unsupported daylight landing of troops and supplies. After all, the 6000 Marines on Tulagi captured that island and a couple of others from some 750 well dug in and well organized Japanese with the moderate loss of about 150 killed and 200 wounded. It's certainly a question whether if the Marines had been on the offensive, instead of dug in on the defensive, the Japanese were in enough strength to fight their way ashore even when on August 18th some 900 Army troops of the famous Ichiki Midway Landing Force of the 17th Army arrived. Considering the number of rear admirals whose performance in action during World War II failed to reach the high standards set by Admiral King and Admiral Nimitz and who were peremptorily removed from command or gently eased into non-battle assignments, it is quite apparent that had Rear Admiral Turner actually made a major mistake on that fateful evening of 8 August 1942, that Admiral King or Admiral Nimitz would not have kept him at sea in one of the more important combat assignments throughout the war. When the captains of opposing football teams meet in the center of the field before the game starts, the referee tosses a coin, the designated captain calls "heads" and the coin turns up "tails." This captain has made a bad guess but not a culpable mistake in judgment. The coach doesn't bench him because of his bad guess. The Battle of Savo Island was primarily a United States Navy defeat. All of the dozen "causes" listed earlier contributed to this defeat. Beyond the U.S. Navy, the Australian Navy and Air Force and the United States Army Air Force also contributed to setting the stage of the defeat. As Commander of Task Force 61, under the Navy code, Rear Admiral Turner bore a command responsibility for whatever success was attained or failure suffered. He did not shrink from his command responsibility. He vigorously set about correcting those matters of operations, training, material and personnel which were within his purview, and recommending action in other areas. To begin with, it should be noted that upper echelon commanders generally made operation reports on whole operations such as WATCHTOWER, and group, unit, and ship commanders made action reports on battles occurring during the operation. So it could as logically be said that Admiral Turner made no action report on the campaign in the Gilberts, the Marshalls, or the Marianas, omitting to state that he made operational reports. Rear Admiral Turner, as Commander Task Force 62, or as Commander Amphibious Forces South Pacific originated three written official reports concerning the WATCHTOWER Operation which included the Battle of Savo Island. The first report, three pages in length plus a track chart, reproduced on page 356 was dated 12 August 1942 and titled "Night Action of Savo Island, August 8-9, 1942." It described and summarized the action as known at that early date by CTF 62. It included a "sketch chart, Battle of Savo Island" and requested any additional information that the Second-in-Command could furnish. It was addressed to the Second-in-Command, TF 62. A copy was given by hand by COMPHIBFORSOPAC (Turner) to COMSOPAC (Ghormley) together with 67 pages of reports from subordinate unit commanders. COMSOPAC sent all of this on to COMINCH via CINCPAC on 16 August 1942, as part of COMSOPAC's "Preliminary Report WATCHTOWER OPERATION." The initial document penned by Rear Admiral Turner, together with the track chart and other reports, was described officially by COMPHIBFORSOPAC as a "fairly comprehensive preliminary report," and is just that. The second Amphibious Force, South Pacific report was dated 29 August 1942, and forwarded reports from eleven ships regarding the first three days of the amphibious landings as well as the night battle off Savo Island, and stated that "comment on tactical features of the night battle of Savo Island" will be submitted by the Commander Amphibious Force, South Pacific in his report of the WATCHTOWER Operation." In addition to these reports originated by Rear Admiral Turner, on 15 October 1942, COMSOPAC addressed to CINCPAC a supplementary report to his preliminary report on "Operations in Solomons, 7-9 August 1942." This comprehensive report was forwarded to CTF 62 for comment before forwarding to CINCPAC and COMINCH, and thus gave Rear Admiral Turner a chance to provide any additional facts, and to express any differences of opinion that he might have had with COMSOPAC in regard to the known events or COMSOPAC's interpretation of them during the operations covered. So it is hardly the correct story to say that "Admiral Turner made none," when writing about official reports on the Savo Island battle. Admiral Turner was quite prepared to admit that he had not turned in a flawless performance in WATCHTOWER or "any other big operation." Admiral Turner believed that the major effect of Vice Admiral Fletcher's announced intention of withdrawal on the actual Battle of Savo Island was that it resulted in Rear Admiral Crutchley not being with his Screening Group at the particular time the Japanese struck. It was his opinion that this was a serious loss of command ability, command cohesion, command knowledge of the situation, and command offensive response. Admiral Turner thought that there were a number of major lessons which he had learned out of the WATCHTOWER Operation, but that not everybody would agree with him. His key thoughts in 1960 related to organization. 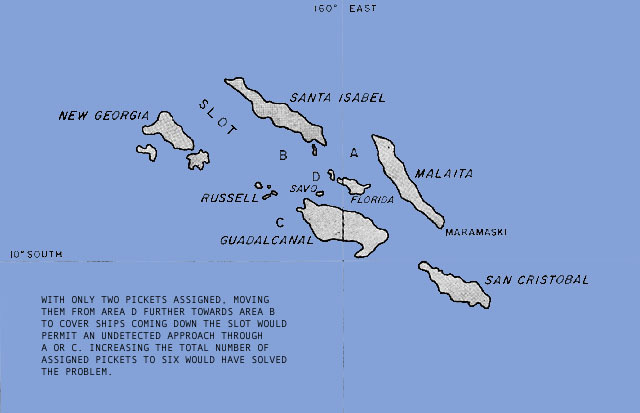 The basic task force organization established by COMSOPAC placed Commander Expeditionary Force and the Commander Aircraft Force, South Pacific at the same level in the command echelon. At the next lower level were Commander Air Support Force and the Commander Amphibious Force. at the top level, where the major element of air reconnaissance in the SOPAC area was not under the operational control of the Commander Expeditionary Force. Had TF 63 [the air reconnaissance force] been included in the Expeditionary Force, perhaps Frank Jack [Fletcher] would have felt more like an Expeditionary Force commander and assumed a greater responsibility for sticking with the whole Force through to a success. The lesson to be drawn from these remarks is that defeat in battle early in a war can quickly gain adherents to sound principles which will produce future victories. 1. Admiral Hepburn, Class of 1897, alive at age 87 at time this chapter written. 2. Naval War College, Savo Island, Vols. 1 and II. 3. (a) Richard F. Newcomb, Savo, The Incredible Naval Debacle off Guadalcanal (New York: Holt, Rinehart and Winston, 1961); (b) Stan Smith, The Battle of Savo (New York: McFadden-Bartell Corp., 1962). 4. (a) Morison, Struggle for Guadalcanal (Vol V), ch. 2; (b) Samuel E. Morison "Guadalcanal-1942" Saturday Evening Post, vol. 235 (July 28-August 4, 1962), pp. 22-23, 63-65; (c) Samuel E. Morison, Two-Ocean War (Boston: Little Brown and Co., 1963), pp. 167-77. 5. Turner. Actually only a total of 41 APs were in commission on 8 August 1942. 16 APs were assigned to the Pacific Fleet on 8 August 1942. (PACFLT Fleet Notices 18CN-42 of that date). 8. Morison, Struggle for Guadalcanal, p. 63. 9. Morsion, "Guadalcanal-1942," Saturday Evening Post. 10. Morison, Two-Ocean War, p. 169. 11. Hepburn Report Vol. 1, no ser of 13 May 1943; Memorandum for Admiral, 31 Jul 1943, attached by Reviewing Officer. 13. Zimmerman, Guadalcanal Campaign (Marine Monograph), p. 50. 14. Miller, Guadalcanal: The First Offensive (Army), p. 78. 15. Newcomb, Savo, pp. 80, 82, 86. 16. COMSOWESPACFOR to All Task Force Commanders, Pacific Fleet, 080717 Aug 1942. Cited in Hepburn Report, Annex T.
17. (a) Naval War Collete Savo Island, Vol. 1, p. 101; (b) COMSOWESPACFOR Communication Officer to Commander D.J. Ramsey, memorandum, 19 Feb 1943. Cited in Hepburn Report, Annex T.
CTF 62 Immediate Subordinate Commanders who were CTG 62.1, CTG 62.2, 62.3, etc. 19. Hepburn Report, Vol. 3, Communication Log. 20. General Headquarters Southwest Pacific Area, Signal Annex to Operation Instruction Number Two, 25 Apr 1942. 21. COMSOWESPACFOR Communication officer, memorandum, 19 Feb 1943. 22. Morison, Struggle for Guadalcanal, p. 25. 23. Naval War College, Savo Island, Vol. 2, p. 383. 24. COMSOWESPACFOR to all Task Force Commaqnders, 080947 Aug 1942. 25. Naval War College, Savo Island, Vol. 1, pp. 101, 383 (18). The quoted version is found in both COMSOPAC War Diary and the Hepburn Report, as well as the Plotting Room Officer, COMSOPAC, to Admiral Ghormley, memorandum 14 Aug 1942. 27. (a) Chokai War Diary; (b) Japanese Eighth Fleet War Diary, CIG 74633, USSBS Interrogation. 28. (a) Turner; (b) Staff Interviews. 29. Copy of Memorandum supplied by Captain Charles W. Weaver USNR and original then located in Comsopac files. 30. (a) COMSOPAC Action Report; (b) Turner; (c) Staff Interview; (d) Undated, but probably June 1943 Official Statement of Rear Admiral Turner on Admiral Hepburn's Report. 31. COMSOWESPACFOR to CINCPAC and All Task Force Commanders, Pacific Fleet, 0-81130 Aug 1942. Hepburn Report, Annex T.
32. CTF 62 to COMAIRSOPAC, 081055 Aug 1942. Hepburn Report, Annex T.
33. CTF 63 to CTF 61 into CTF 62, 081233 Aug 1942 in Hepburn Report, Annex T.
34. CTF 62 to CTF 63, 070642 Aug 1942. Hepburn Report, Annex T.
35. Hepburn Reporit, 13 May 1943, paras. 85, 87. 36. CTF 61 to CTF 63, 90857 Jul 1942. Hepburn Report despatches. 37. CTF 63 to CTRF 61, 300820 Jul 1942, Hepburn Report desptaches. 38. COMSOPAC Op Plan 1-42, Ser 0017 of 16 Jul 1942, para 3, Annex Baker. 39. COMAIRSOPAC to COMSOPAC, 190646, 201300 Jul 1942. Hepburn Report dispatches. 41. Ghormley manuscript, p. 68. 44. CINCPAC, letter, PAC-11-SN-A17, Ser 00888 of 28 Jun 1943, subj: Comments on Hepburn Report, Annex F to encl. (A), p. 2. 46. CTF 62.6 to CTF 62, 072211 Aug 1942, Hepburn Report, Annex T.
49. (a) Staff Interview; (b) CTF 62 to CTG 62.6, 080937, Aug 1942, Hepburn Report, Annex T.
50. RKT to Director Naval History, letter, 1948. 51. Hepburn Report, para. 84. 52. Naval War Collete, Savo Island, Vol. 1, p. 90. 55. Naval War College, Savo Island, Vol. 1, p. 348. 56. Hepburn Report, para. 92. 57. CTG 62.6 to Admiral Hepburn, memorandum, 21 Feb 1943. Hepburn Report, Annex B. 58. USSBS, Interrogations of Japanese Officials, USSBS Interrogation No. 255, Vol. I, p. 255. (Rear Admiral M. Matsuyama). Hereafter only the USSBS Interrogation No. and the page from Interrogations of Japanese Officials will be cited. 59. RKT, Memorandum for Admiral Hepburn, Mar 1943, p. 10, Hepburn Report, Annex F.
60. Admiral Turner to DCNO (Admin), official letter, 20 Aug 1950, subj: Comments on Morison's Vol. V, pp. 10-11. Note Admiral Turner's statement that Hobart was near XRAY Group. 61. Hepburn Report, para. 95. 62. RKT, Memorandum for Admiral Hepburn, Mar 1943, pp. 4-5. 63. Colhoun Anti-submarine Action Report, 7 Aug 1942. 64. Rear Admiral Turner to CINCPAC, official comment on Hepburn Report, 8 Jun 1943. 65. (a) Crutchley to Turner, report, 21 Feb 1943, pp. 4, 5, Hepburn Report, Annex B; (b) COMSOPAC 071142 Aug 1942; CINCPAC 062336, 08141 Aug 1942, Hepburn Report, Annex C.
66. (A) CTF 62 to COMSOPAC, 090815 Aug 1942, Hepburn Report, Annex T; (b) Monssen and San Juan Acrtion Reports. 67. Hepburn AReport, para. 82. 68. Hepburn Report, para. 89. 69. Action Reports of Colhoun, Monssen, San Juan, Mugford, Wilson, Crescent City, President Adams, Little, Neville. 70. V. Crutchley to RKT, letter, 13 Aug 1942. 71. COMSOPAC to OCMINCH, 081012 Jul 1942. 72. COMSOPAC to COMINCH, 112000 Jul 1942. 73. The Hornet, which on 7 July CINCPAC (CINCPAC 070125 July) had indicated to COMSOPAC might participate in WTOWER, was being held in the Hawaiian Area for defensive and training purposes. 74. Interview with Admiral Frank J. Fletcher, USN (Ret. ), 25 May 1963. Hereafter Fletcher. 75. CINCPAC to COmmander Striking Force, Letter of Instructions, A16-3/A14-3 GG13(12)(16), Ser 0115 of 28 May 1942. 76. CINCSOWESPACAREA, COMSOWESPACFOR 081012, Jul 1942. 78. CTF 61 (Fletcher) to CTF 61.1 (Noyes), 070357 Aug 1437 (local time). CTF 18 (Noyes) to CTF 61, 070527 Aug 1942. 79. (a) Fletcher; (b) CTF 61 to CTG 61.1, 070500 Aug 1942. 80. ONI Summary Information, 8 Aug 1942, (CINCSOWESPACAREA, COMSOWESPACFOR C-127, 7 Aug 1942). 81. CTF 18 to Saratoga, Enterprise, Wasp, 070510 Aug 1942. 82. (a) CTF 61.1 to CTF 16, 070120, Aug 1942; (b) CTF 61.1 to Saratoga, 072225, Aug 1942; (c) CTF 61.1 to CTU 61.1.1, 072315 Aug 1942. 84. CTF 61 to COMSOPACFOR, 280201 Jul 1942. 85. CTF 61 to COMSOPAC, 030150, Aug 1942. 87. (a) Kinkaid; (b) Ships' Logs. 88. Data taken from ships' logs. When data for 8 or 0 August does not appear in log, data from 7 or 10 August is listed. Not all the arithmetic checks, but that is the way the logs record the data. 89. The Essex, the next carrier to come into service was not commissioned until 31 December 1942 and joined the Fleet in May 1943. 90. (a) Fletcher; (b) CINCPAC despatch, 062336 Aug 1942, COMSOPAC despatch, 071142 Aug 1942, Hepburn Report despatches; (c) COMSOPAC, Op Plan 1-42, Annex A, para. 1. 91. CINCPAC, desptach, 080141 Aug 1942. 93. Robert Sherrod, History of Marine Corps Aviation in World War II (Washington: Combat Forces Press, 1952), p. 81. 94. BUAER Intelligence Interview, 26 Aug 1942. Lieutenant Commander John S. Thach later became Deputy Chief of Naval Operations (Air) and then Commander U.S. Naval Forces, Europe. The Zero was more maneuverable but the United States Navy's fighters with their good pilots were "more fightable." The Zero out-peformed but did not have the survivability that the armor and self-sealing fuel tanks gave American planes. Nor did it have as heavy armament. Hence the ratio of losses in combat strongly favored the United States Navy. 96. COMSOPAC to CINCPAC 090830, 090831 Aug 1942, Hepburn Report despatches. 98. CTF 61 to COMSOPAC, letter A16-3 (0039N), subj: Preliminary Report Solomon Islands Opeartion. 99. (a) Fletcher; (b) Rear Admiral Harry Smith, a lieutenant commander in 1942 and the Flag Lieutenant to Vice Admiral Fletcher, related the same story in an interview on 17 May 1963. 101. President Jackson Action Report, 19 Aug 1942. 107. Griffith, The Battle for Guadalcanal, p. 68. 108. Miller, Guadalcanal: The First Offensive (Army), p. 75. 109. Hough, Ludwig, and Shaw, Pearl Harbor to Guadalcanal (Marine), p. 257. 111. Hough, Ludwig, and Shaw, p. 257. 115. COMGENFIRSTMARDIV to COMPHIBFORSOPAC, Memorandum, A6-3(4)076/222 AE-0020 of 2 Aug 1942. 118. Morison, The Struggle for Guadalcanal, p. 17. 119. (a) CTF 62 to CTG 62.6, letter, FE25/A16/Ser 0034 of 12 Aug 1942 included in COMSOPAC Ser 0053 of 16 Aug 1942; (b) COMPHIBFORSOPAC to COMINCH, letter, FE25/A16-3(3) Ser 0092 of 29 Aug 1942 with 11 enclosures; (c) COMSOPAC to COMINCH,, letter, A16-3(1)/, Ser 00171 of 156 Oct 1942 with endorsements, including COMPHIBFORSOPAC, A16-3/, Ser 00317 of 24 Oct 1942; (d) COMPHIBFORSOPAC to CMSOPAC and CINCPAC, letter, A16-3(3)/, Ser 231 of 6 Apr 1943. Forwarding copy of lost report of CTG 62.6 dated 13 Aug 1942 re First Battle of Savo Island; (f) COMSOPAC to CTF 62, letter, A16-3/, Ser 0058 of 30 Aug 1942 relating to CINCPAC's Ser 02576 of 23 Aug 1942, re Preliminary Report, Solomon Islands Operation.